Remember the time you had your first movie house experience? The unforgettable eerie sound of the villain moment and the loud explosion of the fight scene, not to mention the sweet aroma of popcorn, nachos, and hotdog sandwiches. We do not know about you, but we just never got over it. We bet you would also like to bring that same experience to your home and you will agree with us when we say that a good home theater system is in order. So today, we are looking at the best 5.1 Home Theater System under 500. 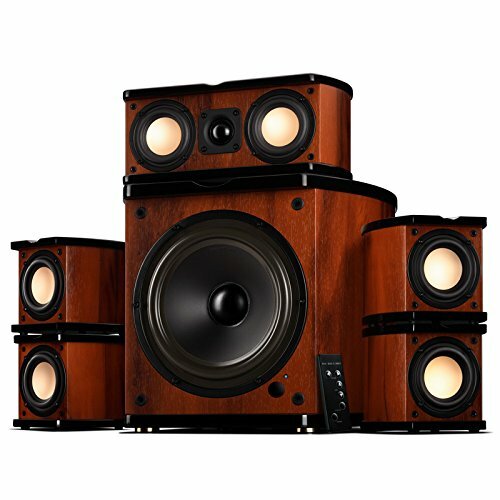 You might now be asking, “Why 500?” This is because as much as we value quality, we also consider budget as one of the primary factors in choosing the best home theater system that will bring you an immersive experience as you watch movies, play games, and listen to music through its surround sound effect. The number 5 in 5.1 stands for the number of speakers. These are the front left, front right, rear right, and rear left satellite speakers and the center channel speaker. Then, the number 1 in 5.1 refers to the subwoofer, which is for bass sounds such as explosions. For small speakers like those in the review, a subwoofer is an important accompaniment. Now that we have laid that vital information on the table we can proceed with the list. In this article, we will review five of the most favorite home theater systems under 500 dollars. We will cover their features, pros, and cons, and we will round them up in summary in terms of design, audio quality, ease of installation, price, and some make or break features. We will even cover their wall mounting capabilities since this is how home theater systems are installed nowadays—wall mounted. 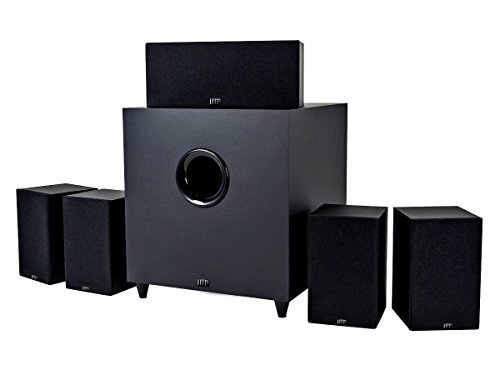 This six-piece home theatre system package is composed of four TL1 speakers, a TL1 center speaker, and a TL1600 powered subwoofer. They have a high-gloss black stone finish with automotive strength. This home theater system is designed with a silk dome tweeter for smooth highs, an aperiodic-tuned rear-firing bass port for smoother lows, and a super-small, long-throw, mid-bass driver for incredible loudness. The speakers have built-in keyhole slots and threaded inserts. Thus, they can be put on shelves, mounted on walls, or stand on the floor. The Polk Audio TL1600 5.1 Compact Home Theater System measures 12.5 x 12.5 x 13.75 inches and weighs 41 pounds. For its price, this home theatre package is at par with some of the good yet expensive models and brands. The sound is clear, and the bass is great. The subwoofer hums even when without audio input. It is only noticeable though during total silence. The Monoprice 10565 Premium 5.1 Channel Home Theater System package comes with four two-way satellite speakers, a single center single with a three-inch polypropylene mid-range driver, and a 3/4-inch aluminum dome tweeter. Each piece has a box-type form with sharp edges. Its eight-inch down-firing subwoofer is fitted with four rubber feet to reduce floor vibrations. With its line level and speaker level line inputs, it can be used with any amplifier. And fitted with a built-in phase control switch on the rear of the sub, its phase is easy to adjust. 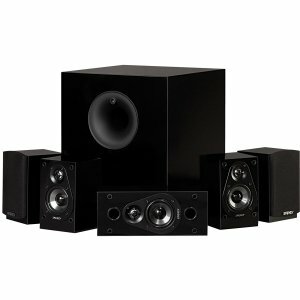 For mounting, this compact and lightweight home theater audio set uses a universal quarter-inch threaded insert. It is also powered by 100 watts. 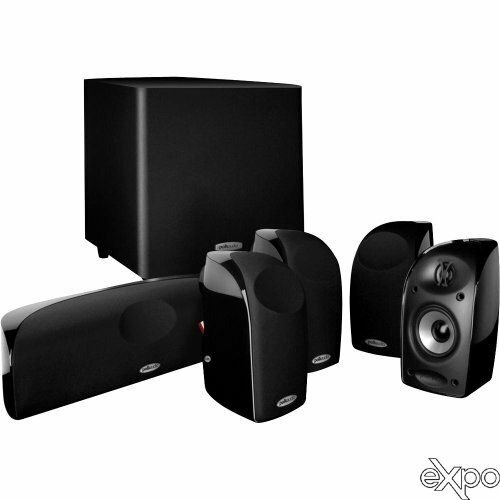 The Monoprice 10565 Premium 5.1 Channel Home Theater System measures 20 x 18.9 x 23.7 inches and weighs 41.6 pounds. It can prove to be a steal. It performs quite well—even better—compared to other more expensive brands. It looks very basic and angular with its box-type design. The subwoofer can come across as blunt unless you can change the speaker configuration from a 3/4 to a 1. The Swan Speakers M20 5.1 Bookshelf Speakers feature a high-end desktop surround sound system, which is also compatible with mini home theaters. It sports a vintage look with its walnut cabinet, piano lacquered end cap and brushed aluminum drivers. This six-piece set comes with each cabinet fitted with high-end drivers, including three-inch aluminum alloy cone full-range drivers, a fabric dome tweeter, and a long-throw eight-inch subwoofer. It is also designed with a special power amplifier circuit for improved dynamic sound and deeper bass. This set has a convenient remote control that lets you switch between 5.1 and 2.1, as well as control volume. It measures 23.7 x 19.8 x 17.6 inches and weighs 48.5 pounds. Furthermore, it is powered by 65 watts for gaming, movies, and music. There is a classic appeal to its wooden cabinet and piano-lacquered end cap combination. For its small size, it works pretty well. The highs, in particular, are great, while the bass is decent. Overall, there is a great balance on the highs, mids, and lows. There is no need for mounting with this 5.1 home theater system. At high volumes, the sound could be distorted. There is a bright blue light around the volume knob, which can be distracting. Having the power switch and the subwoofer volume control situated at the back makes them difficult to access. This home theater system setup is composed of four two-way satellite speakers, a center channel speaker, and an eight-inch Energy subwoofer. The cabinets sport a high-gloss black finish. The 200-watt subwoofer features a front-firing port with eight-inch driver and a patented ribbed elliptical surround for well-defined bass reproduction. The satellite speakers, on the other hand, are designed with a Convergent Source Module that includes a three-inch poly-titanium woofer and a 0.75-inch hyperbolic aluminum-dome tweeter for the high sounds. This gives way to smooth, true-to-life audio from the satellite speakers and the center channel. It is designed for large and small place application. And fitted with keyhole wall-mounts, threaded inserts, and rubber bumpers, it affords the option to mount the speakers on your wall. It measures 19.9 x 19.9 x 22.5 inches and weighs 39.8 pounds. The Energy 5.1 Take Classic home theater system has a beautiful, high-gloss finish. The home theater system works great with music and movies. Spoken dialogue comes out quite clear and better than the TV speakers. The subwoofer is also decent. It has an auto on and off feature so that you do not have to get up to do so. Although advertised as having a piano-like finish, it looks plastic, and the edges are not softened. And it is easily scratched as well. As with most speakers in this price range, they may not work in huge rooms. The subwoofer is loud but nothing as impressive as high-end speakers. But that would be comparing apples to oranges. The rear face of the speaker may not be very durable and can come off after some time. The Yamaha YHT-3920UBL 5.1 Channel Home Theater in a Box System is a five-channel speaker setup with an eight-inch, 100-watt subwoofer, all in black color. With its virtual cinema front setup configuration, it lets you install all of the speakers at the front and still enjoy a surround sound effect. Yamaha YHT-3920UBL supports Bluetooth connectivity for audio playback, as well as 4K ultra HD video with HDCP 2.2 compatibility. This six-piece set is wall-mountable. It measures 16.6 x 26.2 x 21.8 inches and weighs 54 pounds. The sound is perfect for small spaces like an apartment or condo. It has great crisp highs and loud bass, as well as clear mid-frequency audio for speech. It affords you a decent home theater audio system without breaking the bank. It lets you conveniently connect via Bluetooth from your mobile devices. Virtual cinema front setup configuration eliminates the need to scatter the speakers to different corners to get the surround sound effect. With keyhole slots, the speakers can also be mounted on the wall. Some features take time to learn, but you will eventually get the hang of it. The subwoofer starts to get muddy at around the 65% to 75% volume level. The subwoofer is also quite big, which can be imposing in a small space. It is more expensive than the others, but the extra dollars buy you an extra feature—the wireless Bluetooth connectivity. It would have been great if it also supports WiFi. If you find delight in edges, then you are in luck for three of the home theater system packages sport a box type look. The Monoprice 10565, which looks the most basic. The Energy 5.1 Take, only it has a high-gloss finish on the side. And the Yamaha YHT-3920UBL, which shows more sophistication than the previous two with its beveled edges on the four satellite speakers and the subwoofer grill. If you got a thing for curves, then the Polk Audio TL1600 is for you. Its satellite speakers have curved tops and the back edges of the center channel speaker as well. Following suit is the brown and black Swan Speakers M20 with its curved side panels. If Audio Quality is your deciding factor for the best 5.1 home theater system under 500, then the awards go to the Energy 5.1, which makes a good mid to entry-level equipment, and the Swan Speakers M20. The former emits good highs, mids, and lows, and the latter is more suitable for a smaller area. Meanwhile, the Yamaha YHT-3920UBL is also worth mentioning as first runner-up for improving not only the audio quality but also the imaging. Second runner-up is the Polk Audio TL1600, which works great if not for the presence of a low-volume buzzing sound on the subwoofer. Tip: Particular with bass quality? You would want to stay clear of MonoPrice. Still, it is safe to say that all five are decent non-audiophile home theater system packages. You might just need to see which one matches best your preferences and needs. 1. The down-firing subwoofer of the Monoprice 10565. It works great in vibrating the floors but can also be an annoyance to people downstairs. 2. The bright blue light on the volume knob of the Swan Speakers M20. This can be distracting. Plus, you need to reach the back of the subwoofer to turn it off. 3. The high gloss finish of the Energy 5.1. Easily scratched, this design advantage can turn to a disadvantage in a snap. 4. The auto on and off feature of the Energy 5.1. The lack of control cable can also make it annoying. 5. The Bluetooth connectivity feature of the Yamaha YHT-3920UBL. While it affords you convenience, learning to operate the system can prove to be difficult, too. The Swan Speakers M20 is the easiest to install since it does not need to be mounted. Moreover, if you know how each thing connects to each other, then setting up should be easy with all five home theater systems. The Yamaha YHT-3920UBL lets you choose from the standard 5.1 channel system setup, where you put the speakers in front and the rear, and the 5.1 virtual cinema front setup, where you can station the speakers in front and still get the surround sound effect that you want. Of the five, the Yamaha YHT-3920UBL is the most expensive. Whereas, the Monoprice 10565 is the most affordable. In the middle is the Energy 5.1. The Yamaha YHT-3920UBL is above the rest in terms of the features that it can offer. It is great for music, movies, and even playing games. It supports Bluetooth connectivity, as well as 3D and 4K Ultra HD video. Besides the audio quality, you will also notice a marked difference in the visual register of movies and games. 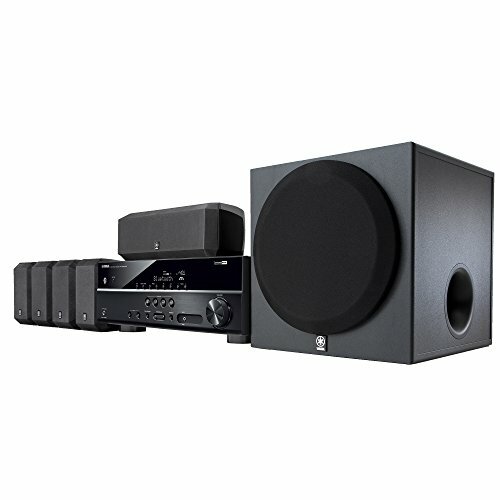 If Bluetooth connectivity feature does not seem so important, then the Energy 5.1 is your best 5.1 home theater system under 500. It offers you the best audio quality for its price. Depending on your budget and what features you prioritize, you may find your match in either the Yamaha YHT-3920UBL or the Energy 5.1 Take Classic Home Theater System. Take your pick.